Argentina’s economy has suffered from repeated crises, deficits, high inflation, mounting debt, and capital moving out of the country. Rich in natural resources, Argentina has a well-developed and diversified industrial base. Agriculture is somewhat limited because less than 15% of the land is arable; most of it is used for cash crops and, thanks to vast grasslands, beef cattle. Both paper making in general and Towel & Tissue (T&T) production are limited. Argentina is 32nd in worldwide T&T production and fourth in Latin America. 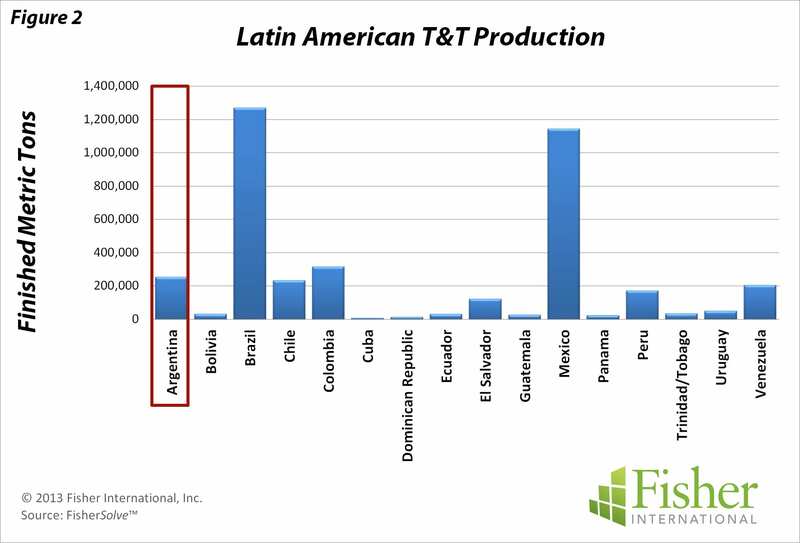 The growth rate of T&T production in Argentina somewhat reflects, but also lags behind, the country’s economy. In 2002 the economy bottomed out. GDP then grew annually over the next six years, fueled by excellent international financial conditions and growth-focused fiscal policies. From 2007 to 2008 growth slowed and the following year, the world economy fell into recession. In 2010 the economy came back strong but has slowed since. The 10 year T&T growth trend was mostly flat, lagging behind the economy, until 2008 when there was a notable two-year increase in capacity.Growth has flattened out again since 2010. By comparison, during this same 10 year period, the remainder of Latin American T&T growth was on a steady incline (Figure 1) even through the world economic recession years. 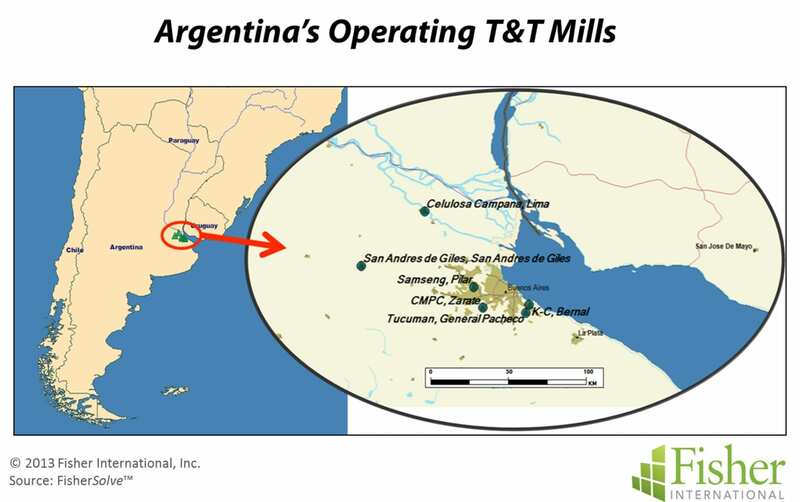 Argentine T&T mills are geographically concentrated in the area around Buenos Aires (Map 1). 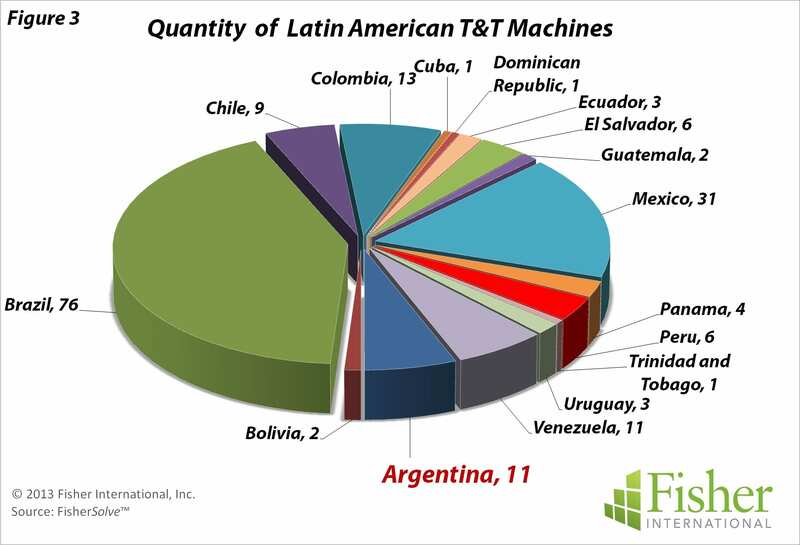 Argentina ranks fourth in capacity among T&T producers in Latin America (Figure 2). 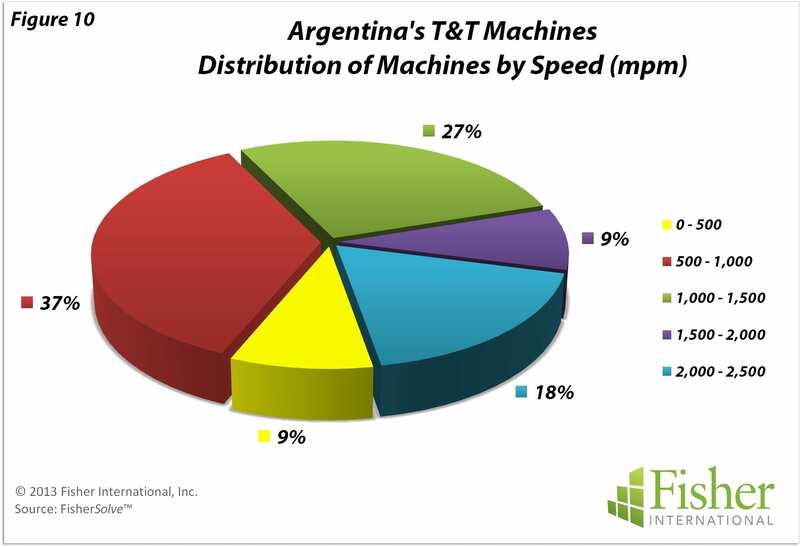 Argentina also ranks fourth (tied with Venezuela) in the number of operating machines (Figure 3). 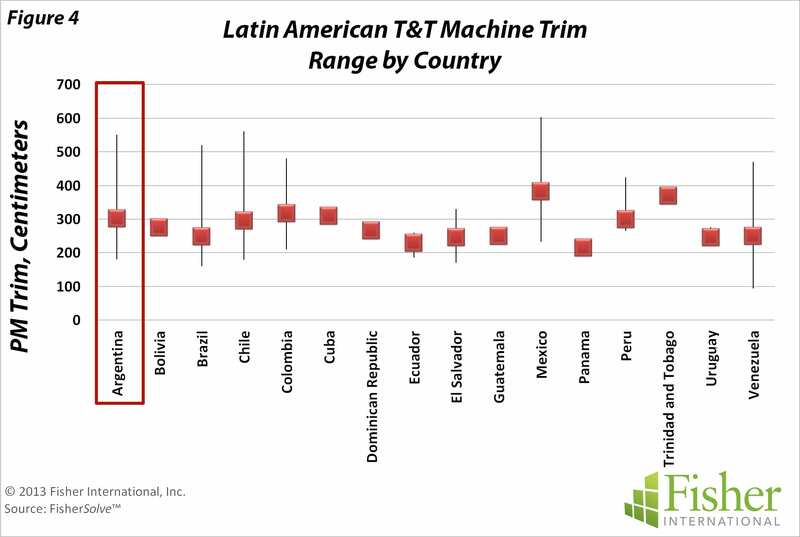 T&T machines in Latin America vary from narrow two-metre machines to six metres. 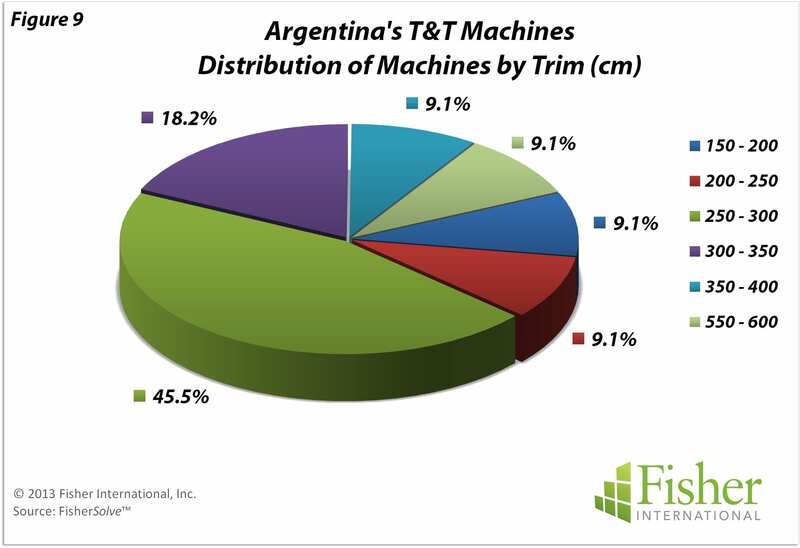 Machines in Argentina are typical in terms of the trim range for the region, with the average being 3.0 metres (Figure 4). 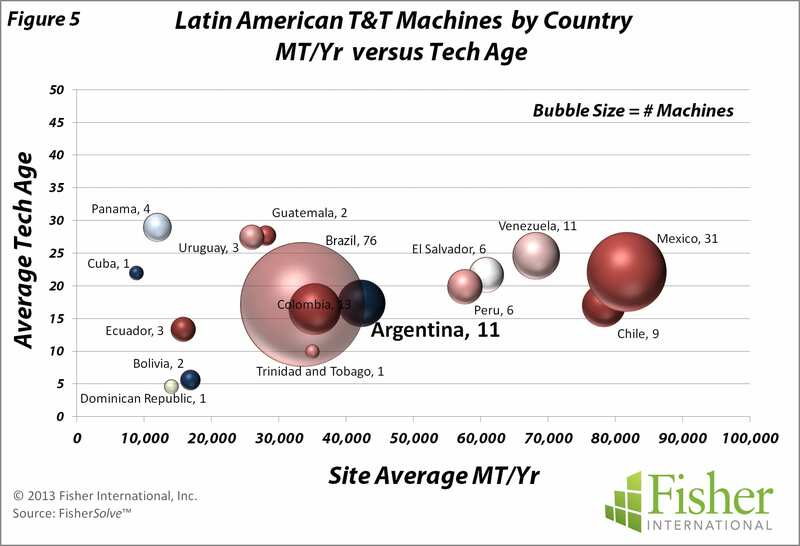 Mill production in Argentina is average compared to other producing countries in Latin America at approximately 40,000 MT/ Yr, as is the technical age of Argentine machines at about 18 years (Figure 5). Argentina’s cost position in the Latin American T&T market is centred between the two largest producing countries, Brazil and Mexico. 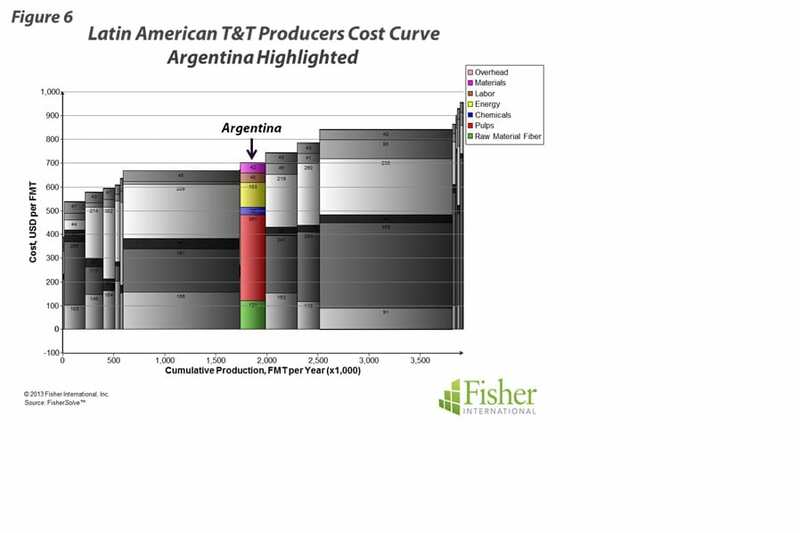 Argentina has a higher dependence on purchased pulp than the largest low cost country but lower labour and energy costs on average compared to the higher cost countries (Figure 6). 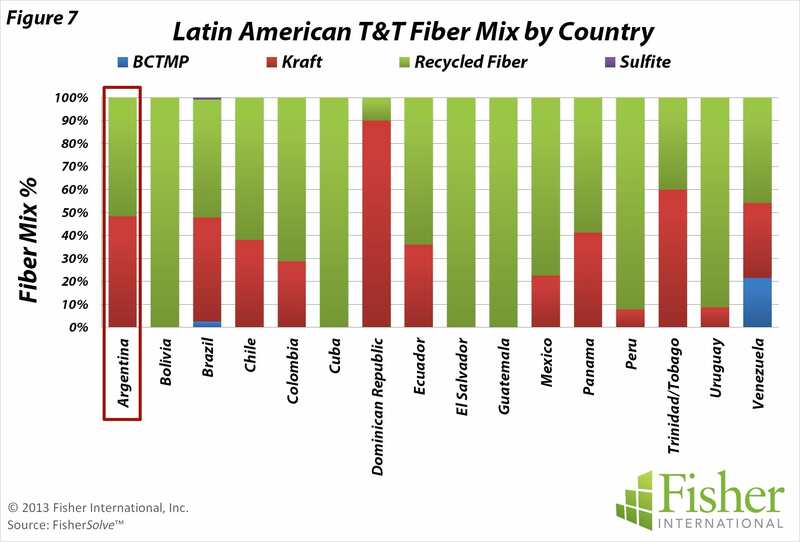 Fibre mix in Argentine mills is 48% market Kraft pulp, with the remaining being recycled (Figure 7). Recycled fibre is present in most Latin American countries, with some using 100% Recycled. Integrated recycled fibre provides some smaller producing countries an advantage over the purchased fibre consumed by larger producing countries like Brazil. 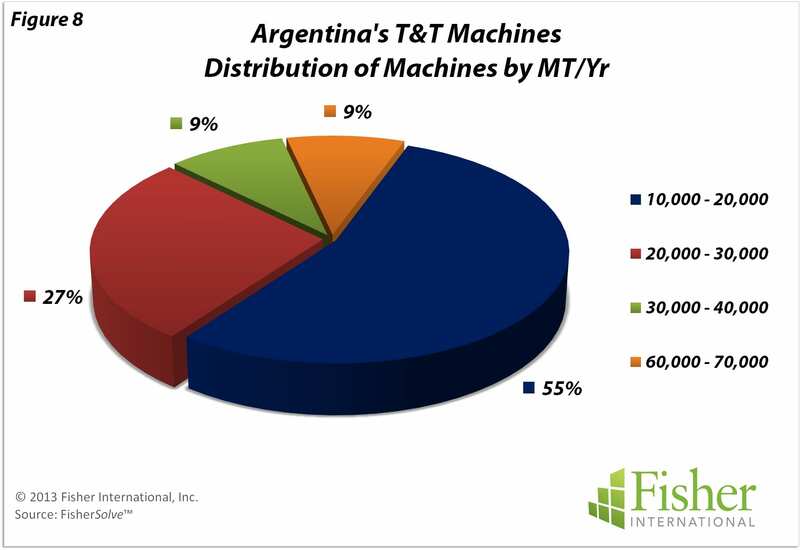 Argentine T&T machine production rates are dominated by small machines producing less than 40,000 MT/Yr. Only 27% of the machines are producing in the 40,000 – 70,000 MT/ Yr range (Figure 8). Machine trims are narrow with about 80% of the machines being less than 3.5 meters (Figure 9). Less than 20% of the machines are wider, falling in the 3.5 – 5.5 metre class. Machine speeds tend to be on the slow side with more than half of the machines below 1,500 mpm (Figure 10). Only 27% fall in the upper range of 1,500-2,500mpm. 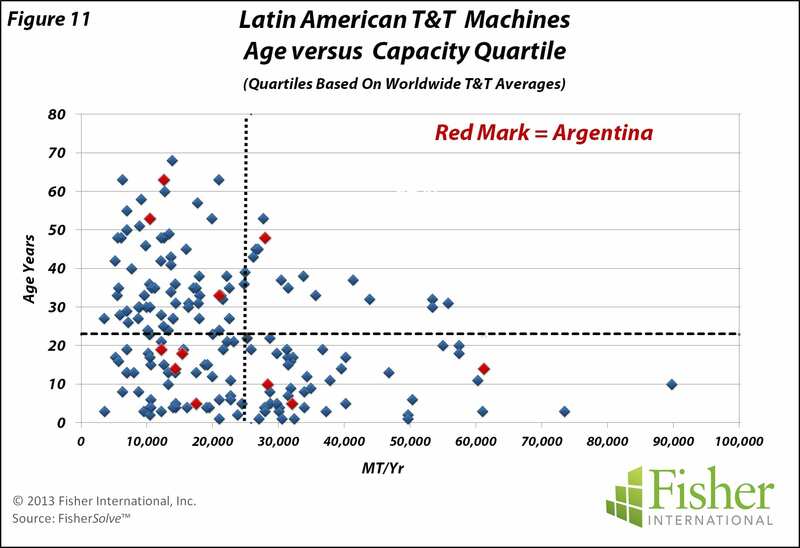 On the international scale, capacity-wise, Argentine machines bias below the average with a large proportion in the group of low-capacity machines. The age of Argentina’s machines has a wide dispersion, with more machines below the average than above (Figure 11). 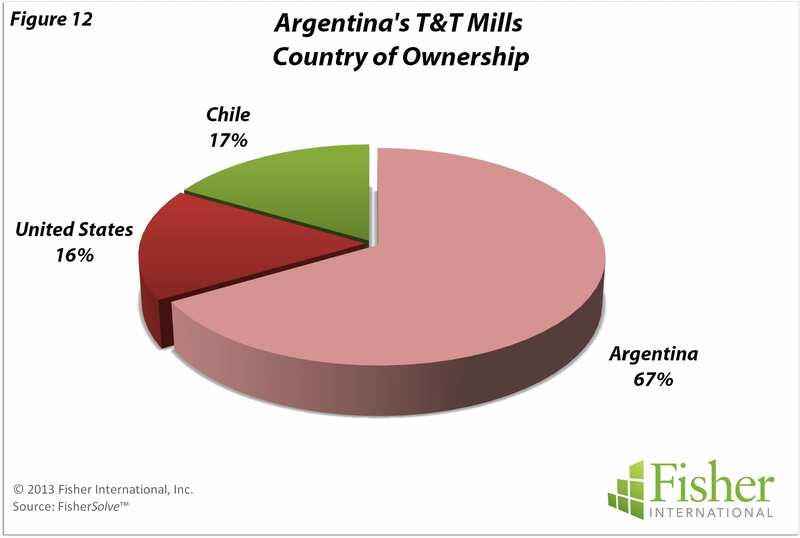 The T&T business in Argentina is predominately local in ownership with nearly 70% being headquartered in Argentina (Figure 12). Fisher International has supported the pulp and paper industry for over 25 years with business intelligence and management consulting. Fisher International’s powerful proprietary databases, analysis tools, and expert consultants are indispensable resources to the industry’s producers, suppliers, investors, and buyers worldwide. FisherSolve™ is the pulp and paper industry’s premier database and analysis tool. Complete and accurate, FisherSolve is unique in describing the assets and operations of every mill in the world (making 50 TPD or more), modeling the mass-energy balance of each, analyzing their production costs, predicting their economic viability, and providing a wealth of information necessary for strategic planning and implementation. FisherSolve is a product of Fisher International, Inc.
Share the post "Argentina: modest, locally focused T&T business"